With the cost of energy increasing monthly, a small investment in controls to automatically turn electrical devices off when no longer needed can save you really dollars. These types of home automation controls should be considered when planning a bathroom remodeling project. 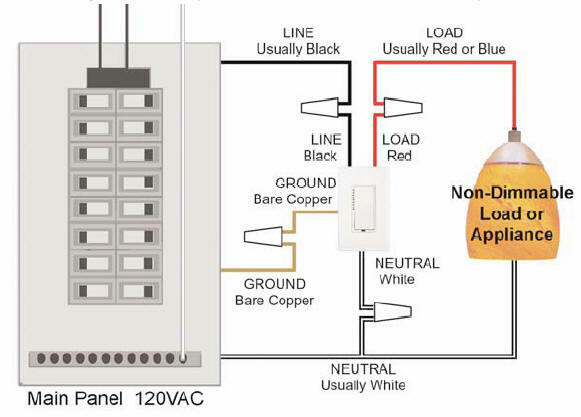 You do not have to be an electrician to install a bathroom exhaust fan timer , as shown in Figure 1. This is definitely a project for a home handyman. Bathroom fans are one of the most common items in a home, that are left on long after they are needed. This is a problem that can be easily resolved by replacing the wall fan switch with an automatic exhaust fan timer. If you can replace a basic light switch, you can replace your fan switch with a timer. There are a wide variety of models available, but they basically all perform the same function. After a period of time, set by the homeowner, the switch goes to the OFF position, removing the electricity from the fan motor. INSTEON is one of the most technologically advanced products available for home automation and it stands-out as a very reliable timer for bathroom fans and / or lights. When you first turn the switch ON it will stay activated for 15 minutes, if you need a longer time - just touch the switch again and it will add an additional hour - each time you touch the switch an additional hour is added to the ON time. 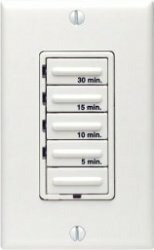 The INSTEON timers use the latest electronic technologies to perform the timing function. There are mechanical timers on the market that use a clockwork mechanism to perform the timing function and although these timers are lower in price, they do not have the life expectations that an electronic timer does. It should be noted that various timers have different load characteristics and it is important that you choose a timer that can handle the circuit load that you wish to control. Using a lower rated timer than the load will result in premature failure of the timer.